As mentioned in the Plenum, Sebastian brought in a biscuit joiner. 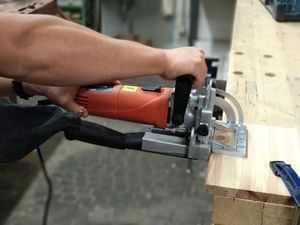 This tool is very useful for panel glue-ups, where the evenly placed biscuits make sure the individual boards don't shift. This tool is not ready for usage yet, since not all commissioning steps are completed yet. The process is not yet tracked on GitHub. Feel free to contribute to making it usable, any help is very welcome! This page was last edited on 25 January 2019, at 16:47.